Hi, I’m Elaine Walker. 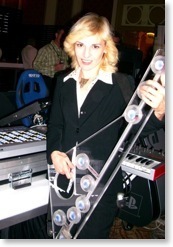 I invented the Vertical Keyboard after years of making various and sundry electronic music instruments for my own band, ZIA, like the Plutotar that I am holding in the photo. Unlike most of my spacey performance instruments, it occurred to me that other people might actually want a Vertical Keyboard for themselves! All of the Vertical Keyboards are handmade with care and unique in their own way. I currently make them from M-Audio and Roland keyboards and most are controllers only, with MIDI and USB ports. However, depending on the model, they can contain sound modules. If you would like to turn one of your own keyboards into a Vertical, it may be possible as well. There is an option for a cello stick so that you can play it cello-style sitting down! Otherwise it is meant to be played with a guitar strap. It’s fun to come up with ideas for new Vertical styles. The first one I made for myself is called the BP-tar. The first one made for the market was dubbed the Vertical1, and after that came the Jupitar, the Insanetar, the Industrialtar, the Furrytar and there are templates for all sorts of other models too - the Cellotar, Vadertar, Gigantar, Startar, Semitar, Kittytar and Avatar, to name a few. Choose a style or come up with your own idea, within reason, and I will build it. If you’d like to know more about me, please visit my personal website - ZiaSpace.com.